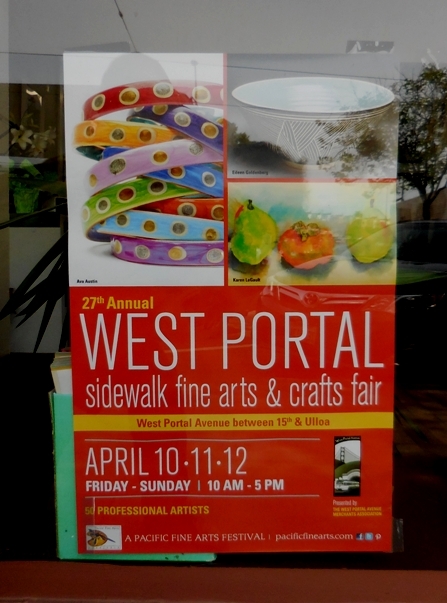 Yesterday in West Portal I saw posters up for this year’s Arts Fair at West Portal. It’s a lovely little fair featuring artists and craftspeople. I always try to visit at least once if I can. I am grateful to this Web site, as I learned about last year’s fair only by the announcement on this blog. However, be cautioned: I spent many, many American dollars buying exquisitely unique treasures that I harvested from talented vendors that have garnered me tremendous joys and countless compliments. Dare I trust myself to venture forth this year?